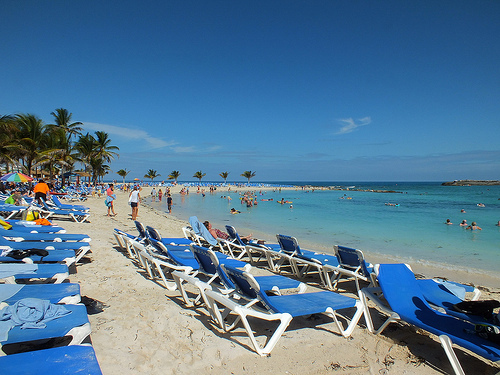 If you're going to Royal Caribbean's private island of CocoCay and are intersted in getting one of the best values for a bit of privacy, here is your guide to what you need to know about renting a beach lounger. What are the beach loungers? Formerly known as cabanettes, the beach loungers are clam shell beach umbrellas that offer privacy and protection from the sun. In CocoCay, the beach loungers have an advantage over the cabanas because they are closer to the ocean for quicker "commutes". What is the cost of a beach lounger? Each beach lounger rental costs $45 and covers two guests. What services come with the beach lounger? The beach loungers are located in the South Beach area, which are away from the crowds and food. As of September 2016, the amenities included with the beach loungers have been removed and a beach lounger rental now only includes the clam shell beach umbrella. How do I reserve a beach lounger? Guests can book a beach lounger online, via Royal Caribbean's Cruise Planner. In addition, the concierge onboard can reserve a beach lounger or guests can book them at the Shore Excursions desk. Keep in mind that reservations tend to go quickly for beach loungers, so it is best to reserve as soon as possible. Royal Caribbean's private island of CocoCay is very popular with guests and on your next visit there, it may be slightly different than you remember. Royal Caribbean Blog reader Sean McLellan recently visited CocoCay over the weekend and sent us a report of some noticable changes. 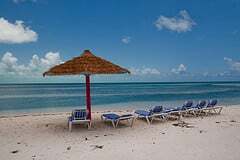 Excursions desk indicates that they are now called "Beach Loungers" and it now runs just under $50 for 2 people for 2 big bottles of water, a fruit plate and towels. In the past, Royal Caribbean has provided a shuttle that is pulled by a tractor to get guests to help with the long distance walk involved. There are now some new trams availabe to take guests. Sean notes these new trams, "run quieter, a tad smoother, and taller so there's less chance of bonking your head on the way out. Oh, the driver gets a little fan." Previously, the tram ran on a path south of the nature trail that went past the island's barracks and ended up east of the Cabanettes. There's now an entirely new tram path that is "shorter" according to the tram driver, which has newly been created that runs north of the nature trail and ends up east of the Cabanettes. There's some big piles of sand marking the terminus that look new. A new fresh water shower has been added to Barefoot Beach. Sean indicated it is, "a nice addition that is just north of the Barefoot Beach Cabanettes/Beach Lounger bar". For the past year or longer an outhouse has been stationed on the previous tram route that is about a 2 minute walk from the cabanettes. Sean's tram driver indicated that there are immediate plans to construct a restroom facility at the cabanettes, which would be a highly welcome change. Royal Caribbean Blog writer Michael Poole is back today to give you a look at what a day at CocoCay looks and feels like! Chances are you have heard a lot about Royal Caribbean’s private island Labadee, but Royal Caribbean's other private destination is called CocoCay. Sure they have many similar features about them and quite a few differences, but I’m going to refer you back to Royal Caribbean Blog podcast episode 73 for that discussion. Today, I’m going to discuss what a day in CocoCay is like and what a first timer can expect while spending a day in paradise. The only real downfall of CocoCay is the tender ride over to the island. Due to the depth in the water the ships must anchor a few hundred yards out and a small tender boats run back and forth. These tender boats are owned and operated by Royal Caribbean and there is no charge for the short ride over. One of the biggest complaints of the tendering is the lines can back up during peak hours. The peak hours are when you first arrive and generally an hour before you leave. Once you get on the tender boat you will be able to capture some great views of the ship and island, so get that camera out! As you are pulling up to the island you will notice some cabanas to the left facing the anchored cruise ship. These are available to rent for $250, generally only open to suite guests and then any remaining cabanas are open to everyone else. Having never rented on myself, I can’t provide a lot of feedback on them, but in CocoCay you don’t have any access to water in the Cabana area. Now that you have arrived in CocoCay, the first thing you must be thinking is where do I go? Sure you have a few options, but most people tend to walk to the left where you will find the first beach area. This is going to be the most crowed area in CocoCay, but there are a lot of beach chairs. If laying in the sun is not something you enjoy they have a hundreds of shaded hammocks around the island, which is truly paradise. My favorite place to explore in CocoCay is a beach called, Barefoot beach. I always tell my friends when we arrive you have to take your shoes off! This beach is going to be the longest walk, but the most secluded from others. The best way I can describe getting there is walk to the shore line, and keep walking right you will run into it within 10-15 minutes. I will note there are no bars or restrooms around you, but not a deal breaker for me. If you happen to bring the kids with you they have a large aqua park available to reserve. The cost for one hour of playtime is $22 and it’s a blast, even for the adults! I must admit I went out to play with my younger sister last month and really enjoyed it, but it’s some workout. I would suggest you reserve online prior to the cruise or once on board, they were sold out all day, while we were in CocoCay. Some other options you can find on the island are sea doo rental, kayaking, and parasailing, though many of these are for the adults. CocoCay offers a complementary buffet style lunch on the island at 11:00am. Some of the items you can find here are: baked bbq chicken, ribs, hamburgers, fruit, baked-beans and mac-n-cheese. Is this going to be the best meal you have all week, not a chance, but it can be fun to eat on the island. Now that you have lunch down you must try their signature cocktail on the island, it’s called the Coco Loco. It’s a frozen island drink and I warn you, chances are you are going to want more than just one. If you have the premium or ultimate drink package these are included, otherwise they are $12 each. Generally after lunch you can find me napping somewhere around the island, but that’s why I love it so much there it’s simply paradise. My favorite place to relax in the afternoon is an area covered in hammocks. Remember when we first arrive in CocoCay I mentioned everyone goes to the left, however if you turn to the right that’s where you will find hammocks everywhere. There is actually a small bridge and once you walk over it you will see all the hammocks. I relaxed here last time and actually spotted a few iguanas. That wraps up our day in Royal Caribbean’s private island of CocoCay. Have you ever visited CocoCay before? What did you enjoy doing while you were there? 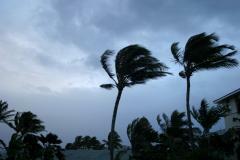 Tropical Storm Arthur forced Royal Caribbean to cancel stops at its private island of CocoCay yesteday and today. Majesty of the Seas will spend its day at sea instead of at CocoCay. Enchantment of the Seas cancelled its arrival at CocoCay yesterday and stayed in Nassau overnight instead. Grandeur of the Seas skipped its stop at CocoCay and instead took a sea day on its way back to Baltimore. Carnival Cruise Lines has announced on select five-night sailings of its Carnival Fascination will swap out a stop at Key West for the private island of Little Stirrup Cay, which is better known to Royal Caribbean fans as Coco Cay. The Fascination sailings that will stop at CocoCay are scheduled for 03/11/2013, 04/08/2013, 05/06/2013, 05/27/2013, 06/10/2013, 06/24/2013, 07/08/2013, 07/22/2013, 08/05/2013, 08/19/2013, 09/02/2013, 09/16/2013, 09/30/2013, 10/14/2013, 10/28/2013, 11/25/2013, 12/09/2013, 01/20/2014, 03/03/2014, 03/17/2014, 04/14/2014 & 04/28/2014. 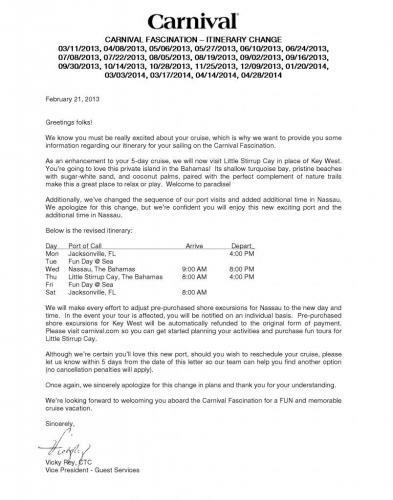 The news of Carnival stopping at Coco Cay came via emails sent to Carnival passengers that had booked the cruise previously. The exact details of the agreement between Carnival and Royal Caribbean are unknown at this time. Royal Caribbean has an existing agreement with the Bahamas for exclusive access to the island via its lease. 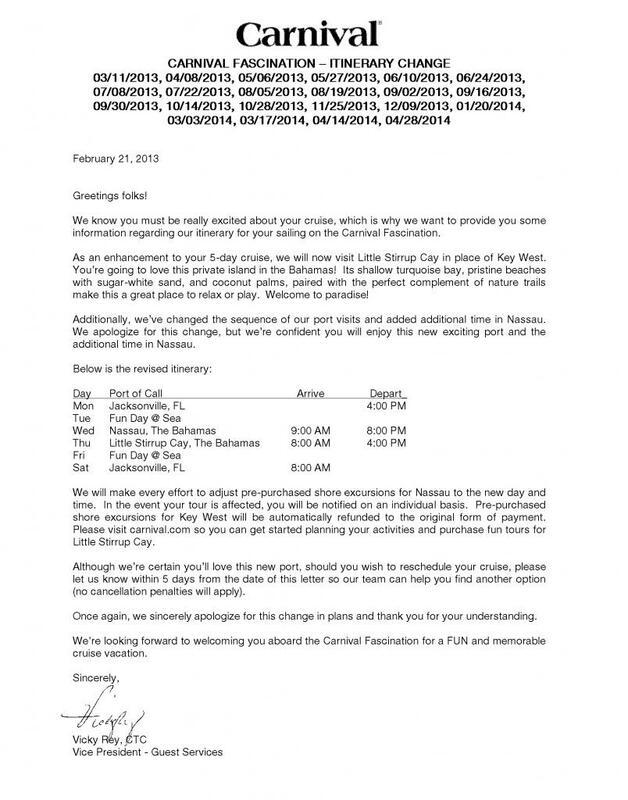 Many are speculating that Carnival will pay Royal Caribbean for access to the island because Carnival's private island of Half Moon Cay is booked up already. Royal Caribbean's private island in the Bahamas, CocoCay, was awarded the Sustainable Tourism Education Program (STEP) Gold-Level Eco-Certification for its attractions and tour operations. The award was presented by Sustainable Travel International, a leading nonprofit that support sustainable tourism development. The certification is the top-tier program and is among the first global standards to be formally recognized by the Global Sustainable Tourism Council (GSTC), and CocoCay is the first operation of its kind to receive the certification. All on-island tours and island operations, including workplace practices, guest communications, and environmental management policies were assessed by a third-party independent of Sustainable Travel International and Royal Caribbean. Royal Caribbean demonstrated an ability to successfully apply its outstanding on-board sustainability initiatives to its shore excursion operations. Royal Caribbean performed extremely well on all policy and documentation criteria. The CocoCay team performed “above and beyond” in areas of guest communications, guest education, group-size policy and visitor code of conduct. All on-island vendors sell locally sourced and produced products from the Bahamas, such as artwork and locally-made crafts. In our second video blog, we preview the Eastern Caribbean itinerary aboard Royal Caribbean's Freedom of the Seas. We preview each of the three islands: CocoCay, St. Thomas & St. Maarten, including what the islands are known for and what the good excursions are. Joining me on today's episode is Kaleigh Lay from CruizeCast. Let us know how you liked the video and any suggestions you have for our cruise! For more videos, subscribe to our Royal Caribbean Blog channel on YouTube.